First impressions have the ability to set the tone of your trip. For those traveling to Singapore on vacation, you can relax knowing your entry into the country will be a delightful experience. 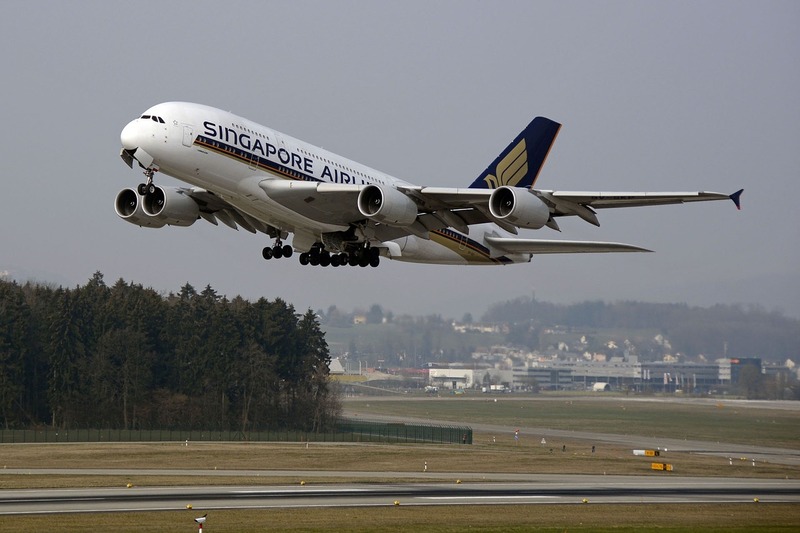 If you are visiting, you are most likely flying into Singapore via Changi Airport (SIN). 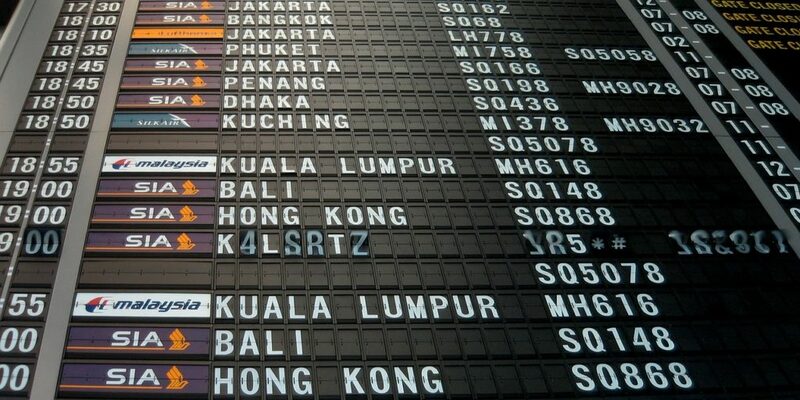 Lucky for you, Changi has ranked as the best airport in the world since 2012. The airport features a state of the art facilities and a wide range of services offered within its terminals. Even to locals, the airport has become an attraction where residents can get a Changi credit card with special deals at Changi stores. 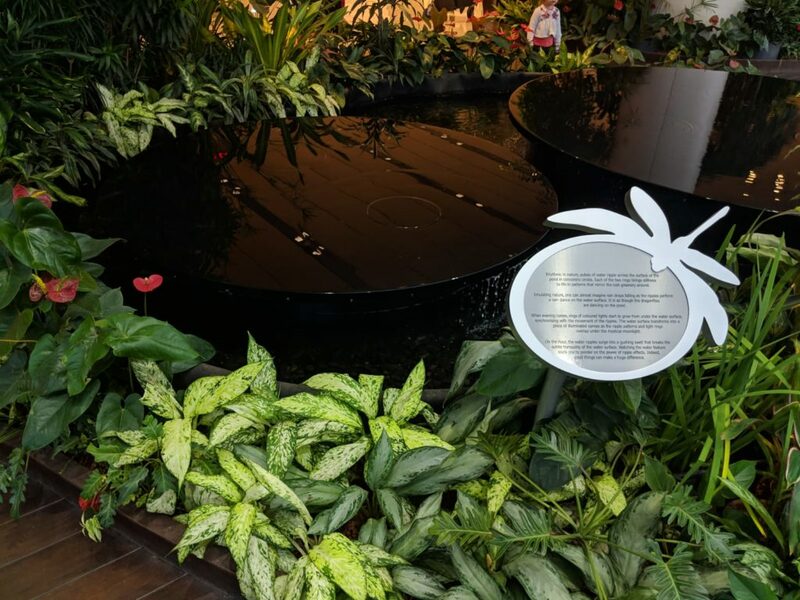 Let’s review some of the best Changi airport attractions you can visit when traveling through the airport. Jewel is the latest expansion at the Changi airport to cement its reputation as the best airport for the coming years. 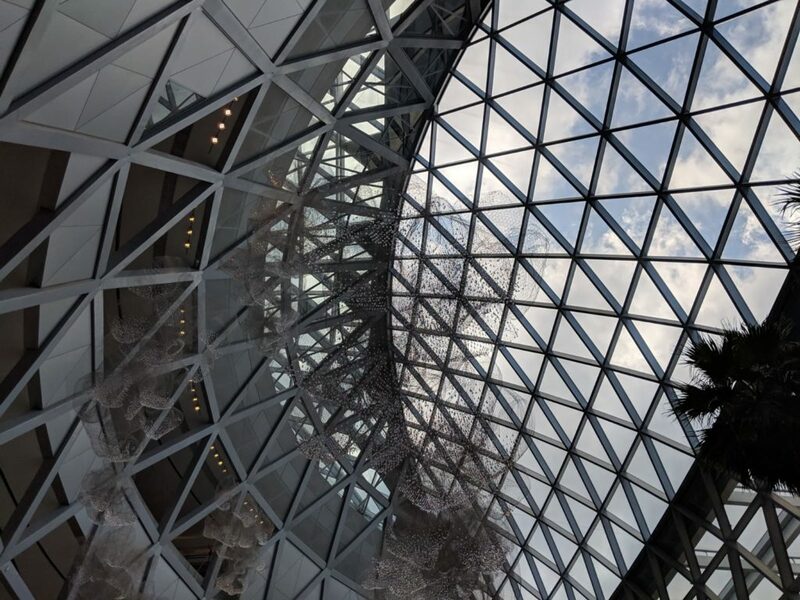 Opened in April 2019, the complex covers more than 134,000 square meters of retail and dining facilities. In addition to featuring over 300 retail and restaurants, there will be traveler friendly business so that you can rest before or after your flight. Special amenities include a daycare center, pharmacy, phone charger rental, and baggage storage. Of course, the “jewel” of the jewel is a 40-meter high waterfall called Rain Vortex. 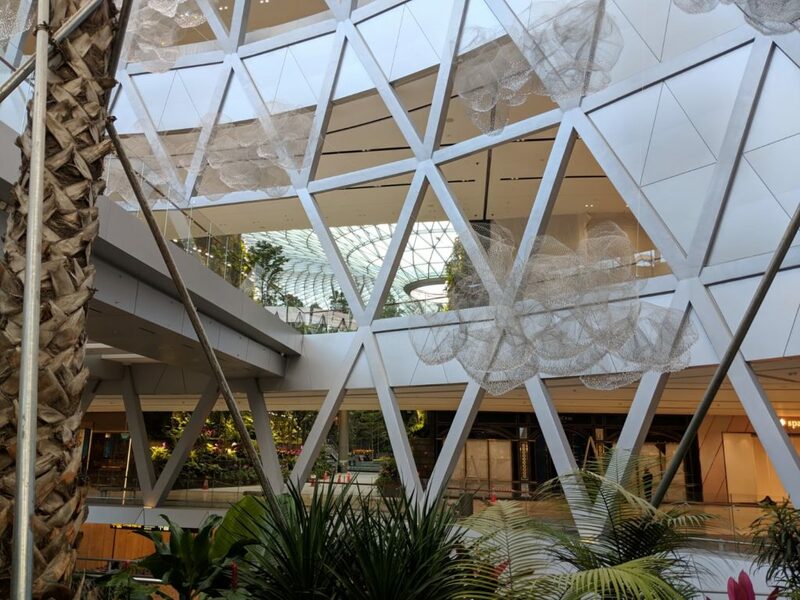 The installation is the biggest indoor waterfall that will certainly cool you off from the hot, humid Singapore weather. The complex is directly walkable from Terminal 1. If you are flying in and out of another terminal, take advantage of the skytrain to visit Terminal 1. The butterfly garden is located at the Departure Transit Lounge (Terminal 3). The garden spans across floor level 2 and 3. Here you will be able to interact and mingle with over a thousand tropical butterflies. The area is brimming with fresh, beautiful flowering plants and an indoor waterfall standing at 6 meters. 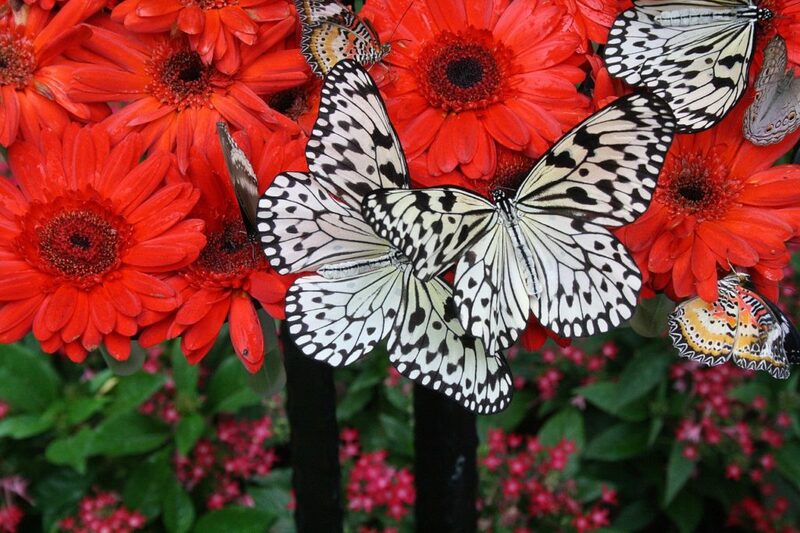 Butterfly Garden is our best pick to explore if you are traveling with children. 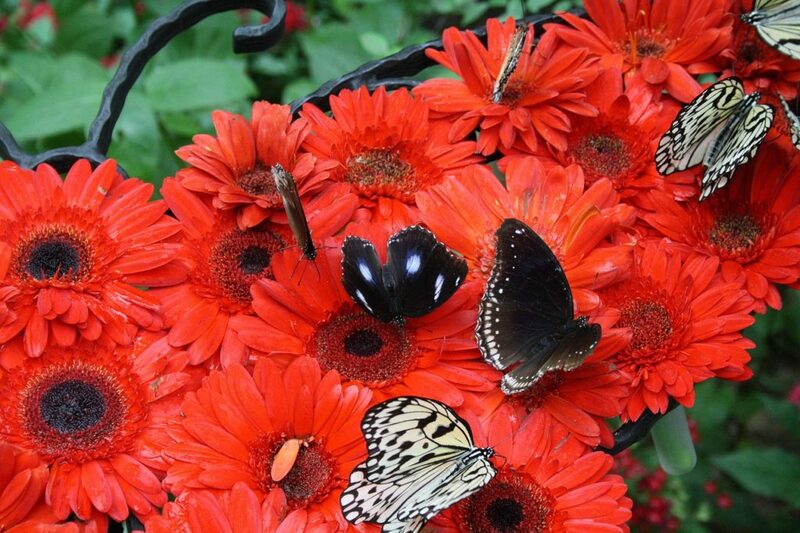 The garden has educational corners where visitors can up-close with these beautiful butterflies. You will also have the chance to learn about breeding and feeding patterns of the butterflies. Do keep in mind that the garden is located beyond the security point so you will need a boarding pass to visit. While you can visit one of many tourist attractions, sometimes you just want to chill and watch a movie. Lucky for you, Changi airport features two movie theaters where you can go and watch freely without being charged a penny. One is located in Terminal 2, and the other is located in Terminal 3. If you have a long layover, you can movie hop between the theaters as they play a different set of films. So if you are a fan of action-packed films and not romantic comedies, one theatre will likely be showing that. If you find yourself in terminal 2 at the transit lounge, you can also visit the entertainment deck and check out the activities going there. There are a lot of fun things to keep you busy here as this is a one-stop entertainment center. Some of the games to find here are PlayStation 3, Xbox 360, and Xbox Kinect. This gallery is open to the public free of charge. It is situated at Terminal 3. Visitors can get the chance to learn the ground operation at the airport and also observe aircrafts that fly in out of the airport. This is the best place to get to know more history about Changi Airport and amazing coordinations required to operate the airport every day. If you feel like you haven’t gotten a good tan, you can visit the swimming pool at the rooftop. The swimming pool features a Balinese theme that will make you relax before your flight. You can also watch planes land and take off as you have a clear view of the runways. This will be an incredible experience that you will not want to miss. 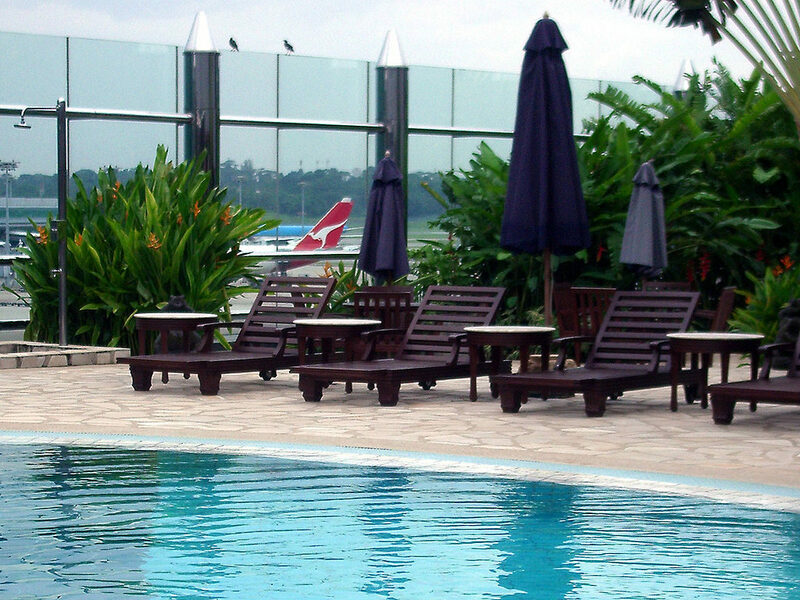 The swimming pool is located on the Ambassador Transit Hotel in Terminal 1 transit lounge. You won’t be charged anything if you book a stay in the hotel. However, you can pay a fee of about $14 to use the swimming pool. This price is affordable considering that it will cater to the swimming, shower facilities, jacuzzi, a non-alcoholic drink alongside a towel. This is a magical garden located in Departure Transit Lounge at Terminal 2. The garden is a sensory experience as you will experience through sight and sounds of the garden. This interactive and decorative garden within the airport features four enormous sculptures of glass bouquet. The sculptures are beautiful with glistening and reflective glasses. The four glass bouquets are surrounded by a vast selection of soft ferns and freshly cut flowers. This is an ideal place for flower lovers who can come and feast their eyes with these selections. This is also an excellent place to relax away from noises. 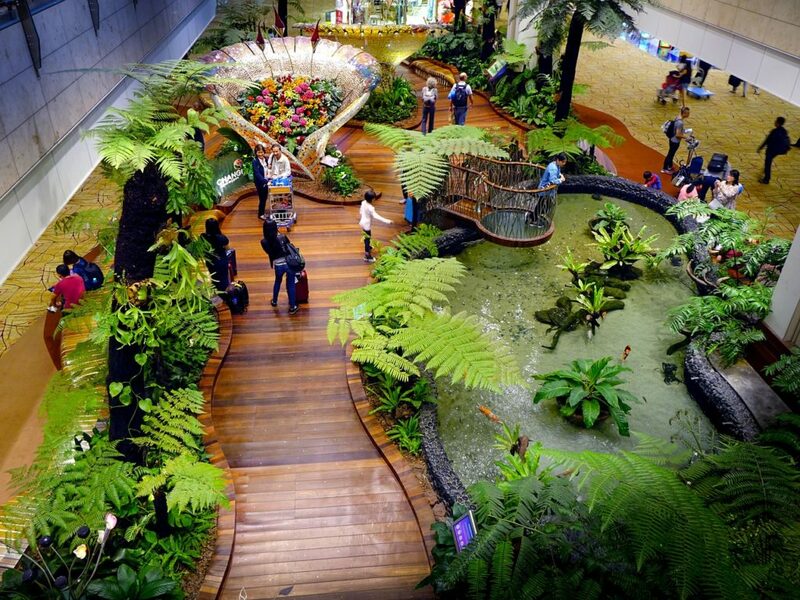 Changi Airport has areas set aside for travelers to relax in, either during or after their flight. You will need to have accumulated a set number of miles before you can freely access this area. However, you can pay a fee to access this area. They are located in each of the transit area Terminal 1, 2, and 3. Terminal 3 has its pay per user lounge situated in the public area known as The Haven. Here visitors can freshen up and even have a nap. Travelers will also enjoy the selection of snacks, light meals and lots of entertainment. Don’t let these fantastic opportunities pass you when visiting Changi Airport. There are lots of other activities you can do within the airport that will save you a lot of money. Get to have an incredibly pleasant stay in this best airport across the globe.